In our last post, Greg and Lisa shared about being Small Group leaders. If you missed it, you can read it here. Today, we get to hear from my friends Reuben and Ellen on the joys of being new parents! So Reuben and Ellen, tell us all about your little one! Our son is Truman and his Chinese name is Hanbei. Right now, he is eight and a half months old. He is a very active little man. He loves to crawl, read, and pull himself up into a standing position. Truman smiles a lot and is extremely curious. Soon he will be walking and running all over Beijing. He likes eating oranges, singing, and playing with his parents’ friends. I’m sure parenthood has its tough moments though. What are some things about life after having a baby that no one tells you about? We read and prepared a lot in advance, so it felt like we were ready for many things that might typically surprise new parents. That being said, we did not expect to be able to handle functioning on such little sleep, nor how difficult it was to get Truman to sleep some nights. It was also impossible to imagine beforehand how beautiful we would find our baby to be, how gentle our hearts became, and how this new little life changed who we were. Thankfully you are surrounded by friends and family for this season. How has your community been supporting you through your transition to parenthood? We have felt blessed by our community ever since we got married. Even though most of our friends are younger than us, many have been intentional about reaching out, even though raising a child has often kept us at home. Our friends and family pray for us constantly. When Truman was born, friends came to the hospital with love and gifts, to meet him and pray for him. Whenever we go anywhere with him, our community is eager to hold and love our son. We have a few friends who are in similar stages. Having some of those relationships has been beneficial to bounce ideas, frustrations and joys around with. One friend, who has recently started a family with her husband, sat us down and for three or four hours unloaded all the knowledge she had accumulated about giving birth and caring for a baby. What are some helpful resources for new parents that you have found in Beijing? TheBump.com and Babycenter.com are great. White noise apps have also been helpful. A couple books in particular, have helped us: Brain Rules for Babies by Dr. John Medina; Your Baby’s First Year by Dr. Steven P. Shelov; and of course, the Bible. There are so many hospitals in Beijing and I’m sure choosing one was not easy. Where did you deliver Truman? And how did you make this decision? We had Truman at Beijing AmCare Women and Children’s Hospital. We looked at several international hospital options, and because this hospital is quite close to our home, we decided to have our delivery there. Several friends had their children there and spoke highly of it, and we were quite satisfied with the facilities, staff, check-up options, and cost. Most of the staff and doctors only speak Chinese, and while there is the option of having a translator there, language is something to consider for those interested in AmCare. It seems like there are a few things to keep in mind here. What is some advice you can give expectant parents on choosing a hospital? Expectant parents should consider location. Imagine having contractions or going into labor at 9:30 in the morning and being stuck in traffic! Everyone will have different expectations for the delivery plan, so before going to a hospital, a couple should discuss what things are important to them and what their budget is. Take a tour and get to know some of the doctors or nurses, if possible. Also think about whether to have a natural delivery or to use an epidural. The woman should know what she wants because making big decisions about using anesthesia during labor is difficult. Every family will be different, but giving birth is an incredibly special event, so maximizing your level of comfort and peace of mind will make it a much more positive memory. If you don’t feel confident in a hospital’s ability to take care of your every need, your experience will be laced with worry. That’s very helpful advice for before delivery! Now moving on to once the baby arrived, let’s discuss an issue faced by many parents in Beijing today. 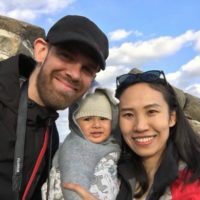 Concerning when the couple is from two different countries, what do they need to know about the citizenship and Passport process for their child? If one parent is Chinese, there are a lot more details you need to be aware of than if the couple are two ex-pats in Beijing. You’ll need to think about what Passport you’d like your child to have, because China doesn’t allow dual citizenship. The child will automatically have Chinese citizenship that will need to be revoked when the child turns eighteen. If you use Roman letters on the child’s birth certificate, he or she will not be able to get a Chinese hukou or ID card. Any time you want to leave China, you’ll need to go to the Entry/Exit Bureau in Andingmen to get a permit for your child. Make sure you call ahead! If you want to get your child a non-Chinese passport, check out your home country’s new Passport application. It probably isn’t a complicated process to apply for one, but you will likely need to bring your child to your embassy and have some documentation proving that he or she is yours. Documentation includes records of pregnancy check-ups, pictures of the couple together during pregnancy, pictures of the couple with the child after birth, documents establishing residency in your home country, and most importantly, the child’s official birth certificate. The most challenging part will probably be getting your small infant safely and comfortably to the embassy! I’m sure throughout the pregnancy and after Truman was born, you participated in some cultural traditions you hadn’t seen yet. How do American and Chinese cultures compare when welcoming a new baby? We had two baby showers that were organized by our American friends and family. We felt very loved and blessed by both events. We thought it was important to have Truman dedicated at our church, and we were able to do that when Reuben’s parents were visiting. We had professional photos taken when Truman was one month old, and again at one hundred days old. We are really looking forward to celebrating his first birthday. There is a Chinese tradition called 抓周 (zhua zhou) that predicts the baby’s future occupation. Different cultures have very different ideas of how to raise a child. What are some cultural differences the two of you have come across already in parenting? Cultural differences have been a big factor in our marriage, but so far, they haven’t played much of a role in raising Truman. There have been a few moments where we disagreed on small, unimportant things, but overall, we try our best to create a God-centered culture in which to raise our son. We also try to communicate very openly as we raise him. Many new and expectant parents in Beijing will be raising their children far away from extended family. How have you been handling the distance from your family? Reuben’s parents live across the ocean in America, so we try to do a weekly video chat with them. It is hard to be away from them but fortunately they were able to visit when Truman was about two months old. We also send them lots of pictures and videos to keep them updated about Truman’s growth. Reuben’s brother and sister have not gotten to interact very much with Truman. The distance with this side of the family is difficult, but it also has been a good way to connect with them. We hope that Truman will recognize them when they meet because Grandpa and Grandma always sing to him when they call! Ellen’s mother has stayed with us a lot and has fun interacting with Truman! The extended family lives in Xinjiang which is also far away. Video chats with them happen for the same reasons. Ellen and Truman were able to take a trip to visit the family in August, which brought so much joy to the family there. We think it is very important for babies to connect with different generations of the family. Finally, what have been some of the best parenting moments so far? We love on the weekends when Truman wakes up and is in a happy mood, smiling and wanting to cuddle and crawl. We can just spend some quiet time in bed, hanging out and being quiet together. We also love when we’ve been gone or out of the room, and we come back, and Truman sees us, smiles, and crawls to the edge of the playpen to get to us. Now, we enjoy all the new things that Truman is learning to do, like standing up, holding things and interacting with us. His personality is more and more visible each day, and we love seeing it emerge and grow. We are so blessed. You really are! Well, Reuben and Ellen, thank you so much for sharing with us today. I’m sure many readers found your advice and experience to be very helpful.